Decorating in authentic, New England nautical style is not intuitive. It takes restraint, and an eye for traditional furnishings. The style that I am describing is not "beachy" or "coastal". I am discussing the traditional New England design found in houses in old towns by the ocean. "Preppy" isn't a synonym for this design style, although east coast nautical style is definitely one variation of a preppy design style. 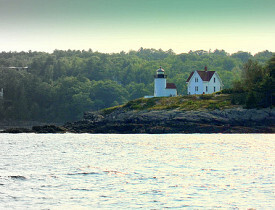 The following concepts characterize New England nautical style. Traditional furnishings: Think antiques imported from "East India" in the 1800's. Don't go crazy with decking your house out like The House of Seven Gables; a little bit of scrimshaw goes a long way. Classic wood furniture: Southern beachy style lends itself to painted furniture, while the classic New England nautical style is characterized by simply finished or refinished classic wood furniture. That's not to say that you won't ever find painted wood furniture in a New England nautical style home. It's more that classic wood furniture has that Colonial look that is so very nautical and New England. If you decorate with sailboats, go big: Molly Frey is an interior designer based in the very New England and very nautical town of Marblehead, Massachusetts. If you scroll through her portfolio (the way her site is set up, I can't link to the single photo that I want you to see), you'll see a huge model sailboat set against an off-white wall. It's an excellent example of decorating with model sailboats. One little sailboat does not New England nautical style make. You need many model sailboats, or one very large one, to say, "Hey. This is New England, and we are sailors." Keep it simple; avoid vignettes: Have a look at Chatfield Design's Islesboro house. She is an interior designer based in Camden, Maine, a town on the Maine coast that is known for its traditional New England nautical style houses. You'll notice that in the Islesboro house, which overlooks the Penobscot Bay, is furnished fairly sparsely. The furniture is excellent quality, and traditionally styled, but the general feel of the rooms is open and breezy. There are few knickknacks. What decorative articles there are all contribute to the New England nautical style of the house. One painting of a sailboat is more New England nautical style than a shelf full of seaside knickknacks. Not everything has to be blue, white, buoys, and anchors: Titus Built LLC, a Fairfield, CT area remodeling company, did an amazing coastal home renovation that is almost devoid of seaside memorabilia (there is a little bit). Using a color scheme inspired by the ocean, and lots of natural wood, Titus Built accomplished a a very New England traditional look, with an open and modern flair. They show that you don't need to use a lobster trap as a coffee table (though if you do, more power to you) to achieve that New England nautical look.